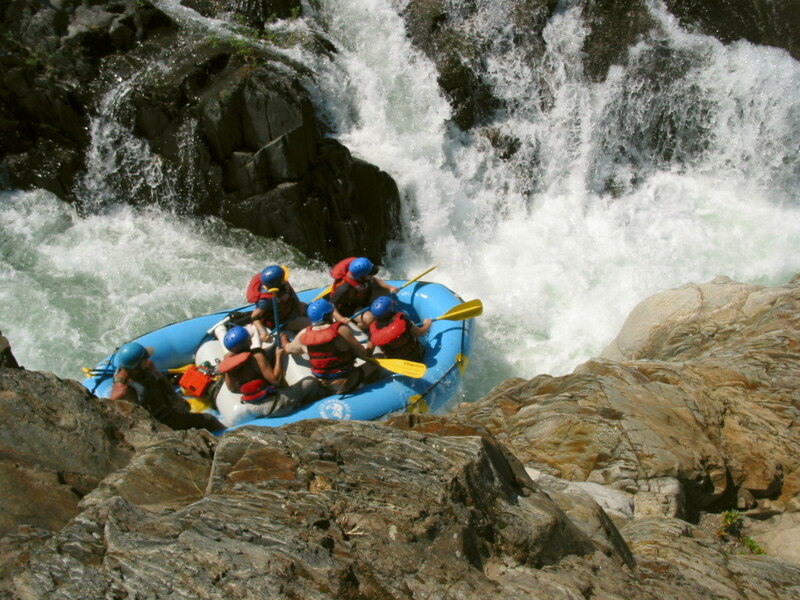 This is an excellent commercial rafting run, with more exciting rapids and better solitude than the South Fork American offers, even on weekdays. During “crowded” weekends on the Middle Fork American, you encounter so few people that you might be glad to see them. 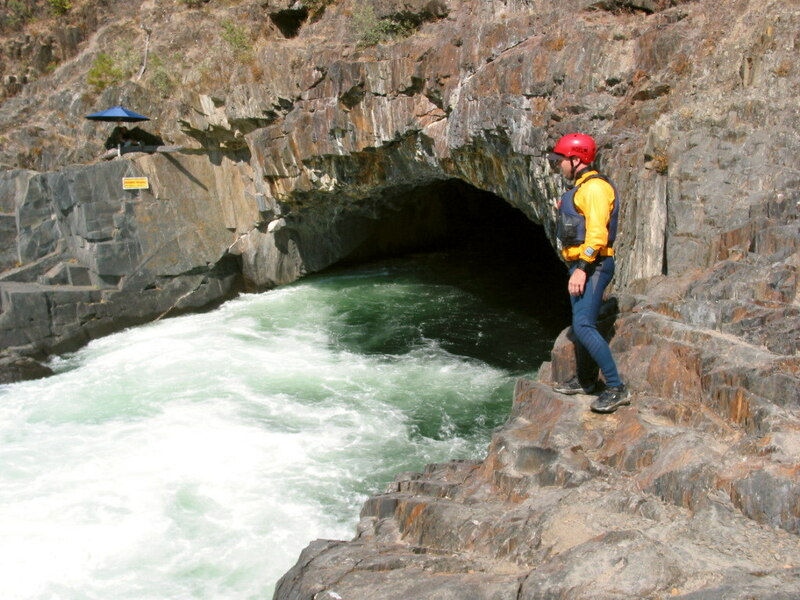 Tunnel Chute (usually rated class V) is quite an adrenalin rush, and the portage around Ruck-a-Chucky (formerly rated unrunnable) is amazing. Additionally there are two challenging class IV rapids, and many class III rapids for several miles at start and finish. 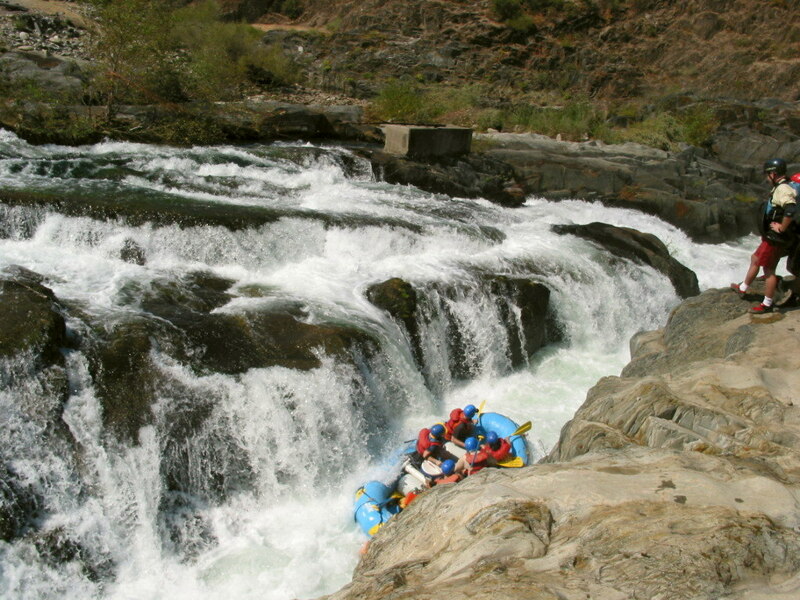 Due to difficult shuttle and long distance on the river, this stretch makes an excellent overnight trip with a commercial rafting outfitter. 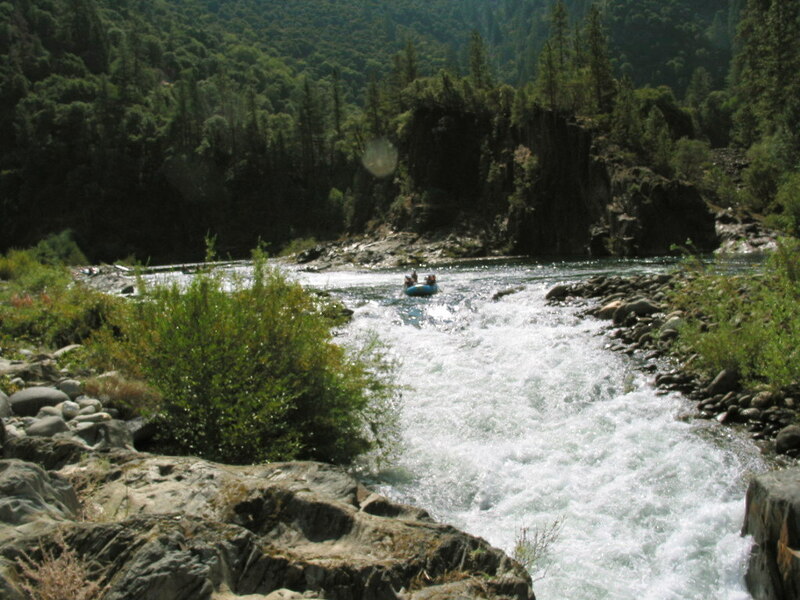 The outfitter takes care of shuttle, provides meals, optional camping, and puts a trained guide in each boat. This is also a good kayaking run in summertime, especially as a change of pace from the Tuolumne or South Fork American. 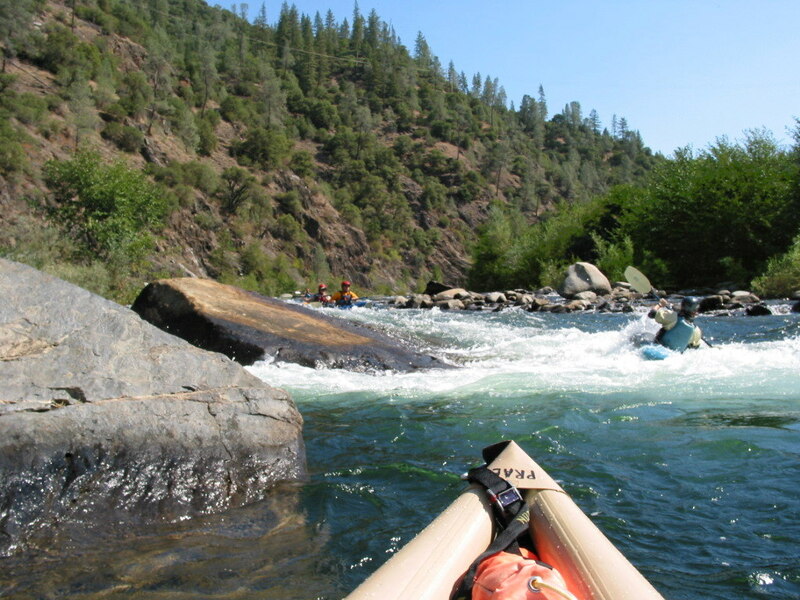 There are fewer rapids here than on the Tuolumne, but the scenery is better. Usually starting in July, there is a bountiful blackberry harvest in the middle (flatwater) portion. 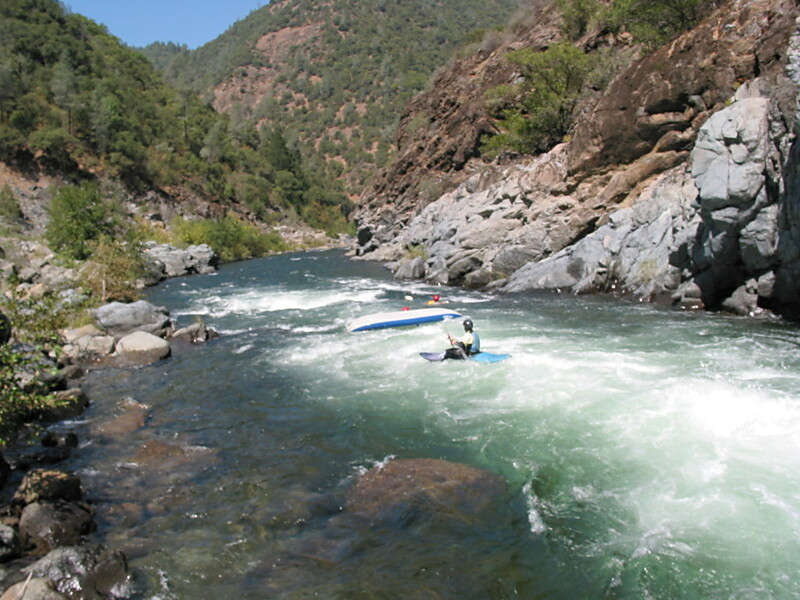 In his 1974 guidebook, Charles Martin wrote that this run has “by far the most interesting rapids of the dam-controlled rivers that flow during the summer. However, the long paddling distance, the strenuous portages, and the difficult shuttle have kept this run from gaining the popularity it deserves.” Things have improved since then! 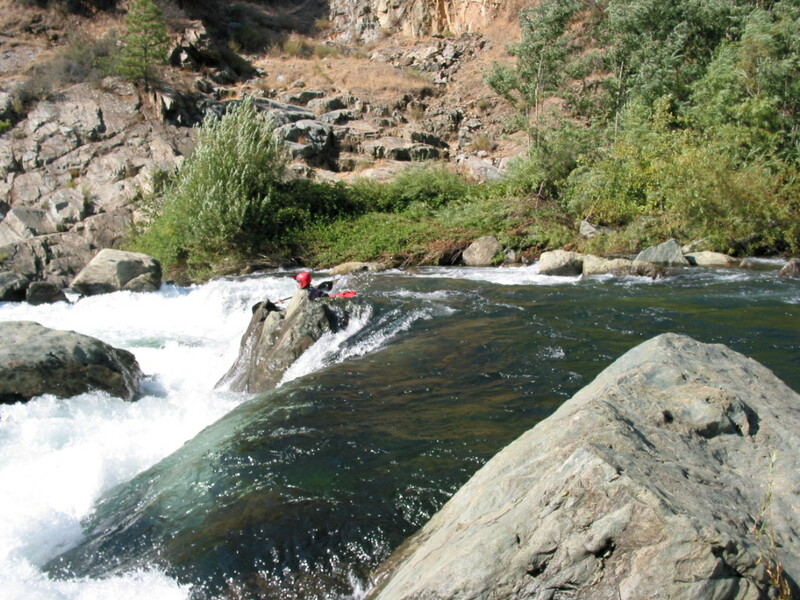 A dedicated put-in eliminates one mile of flatwater paddling on Ralston Afterbay and a portage around Ralston dam. The rocks at Tunnel Chute seem less sharp and intimidating than they did over 30 years ago, eliminating a second portage. 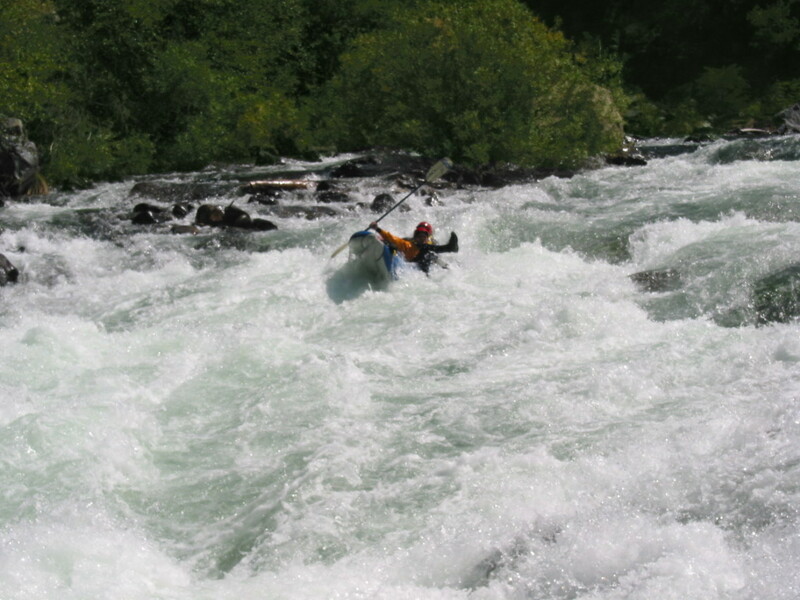 High water in 1992 changed Ruck-a-Chucky rapid from unrunnable to merely class V+, so the portage doesn't seem so bad now. 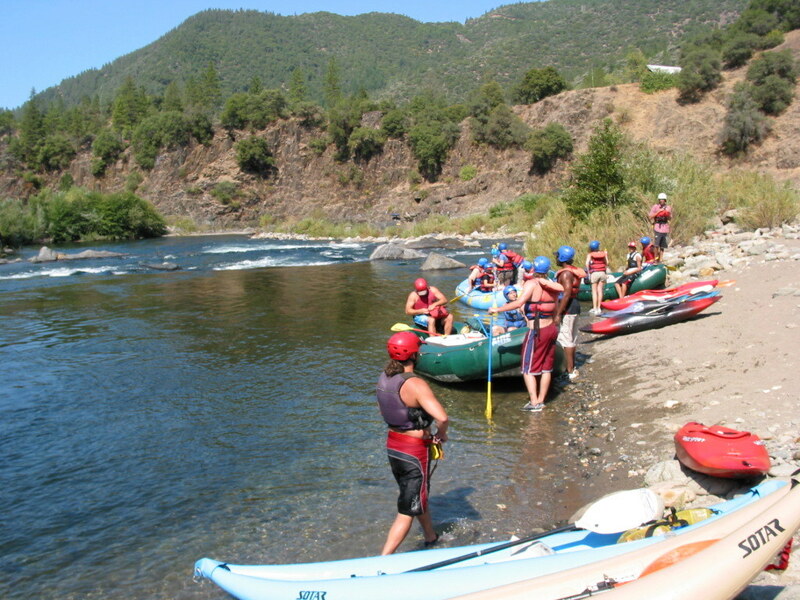 It should be mentioned that commercial rafting (and kayaking) would be eliminated if Auburn Dam were ever built. 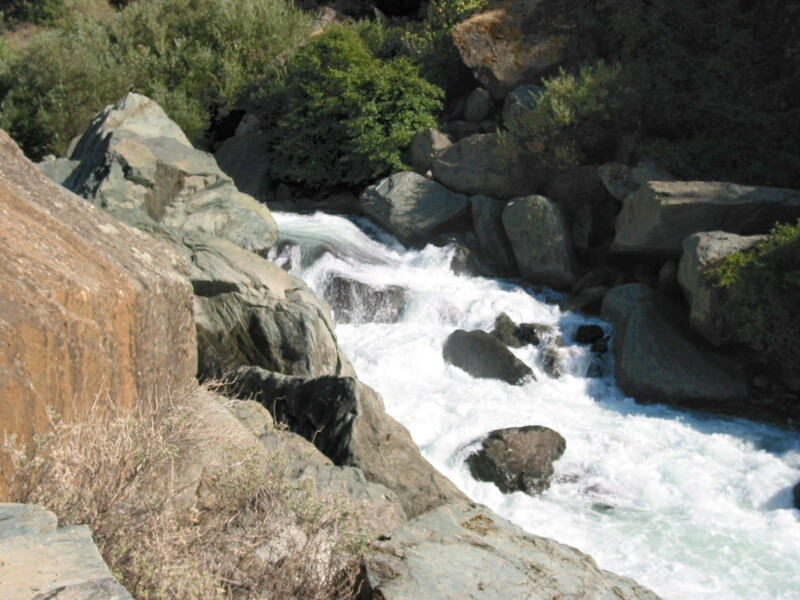 At one time this entire run was to have been drowned under Auburn reservoir, but discovery of an earthquake fault near the dam site worried downstream residents in Sacramento, so the project was shelved. Meanwhile requisite construction costs have escalated, so the dam becomes increasingly unaffordable in these days of budget deficits. 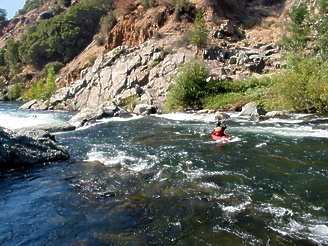 In late 2007, construction features were removed, the first phase of converting the dam site to a recreation resource. In early summer, Oxbow powerhouse usually releases 1150 cfs around the clock. In late summer, releases start around 6:00 AM, except for occasional unpredictable days with no release. In drought years there are often no releases on Sundays. 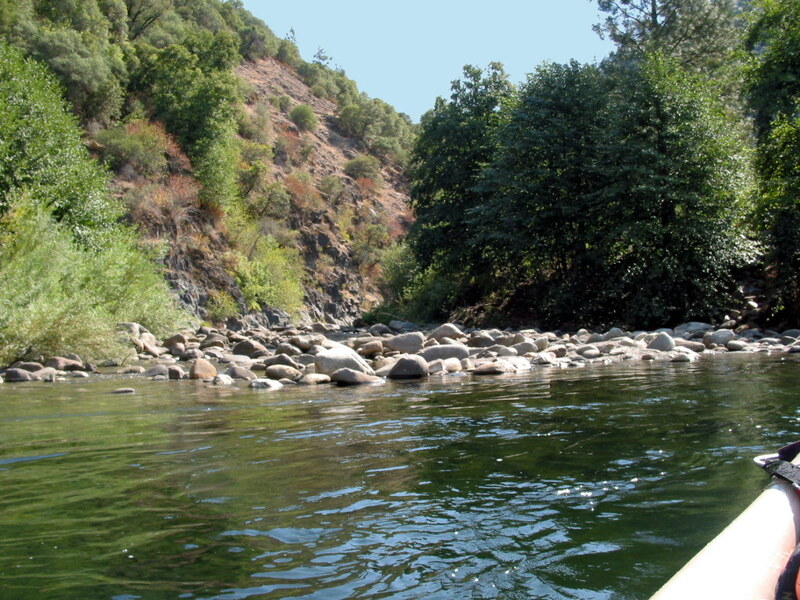 You can put in as soon as hydropower releases start, or at sunrise, whichever comes last. Given the length of this run, it's good to begin early. 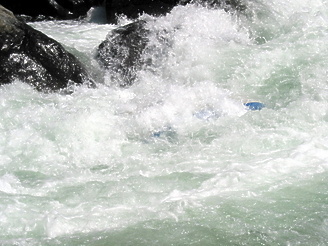 The run immediately downstream is described in the Middle Fork near Auburn writeup. 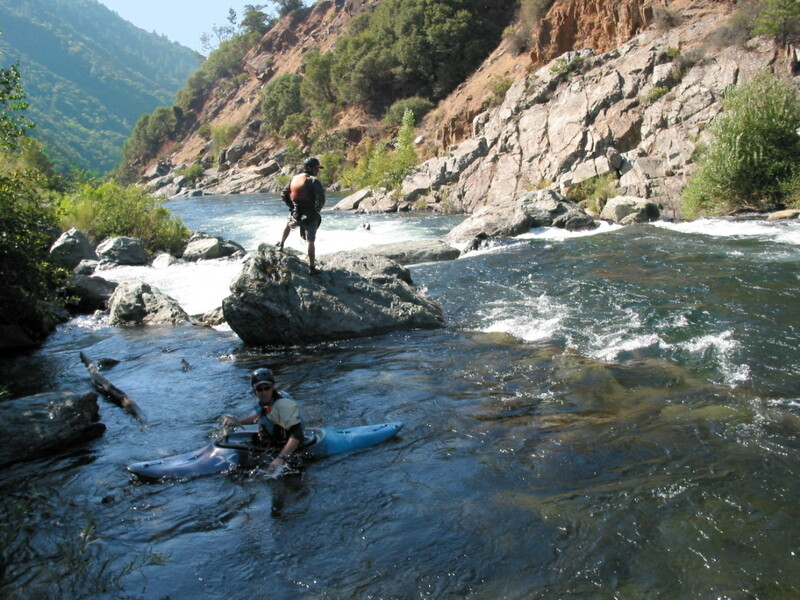 One of the runs upstream is described in the Rubicon River near Forestville writeup. 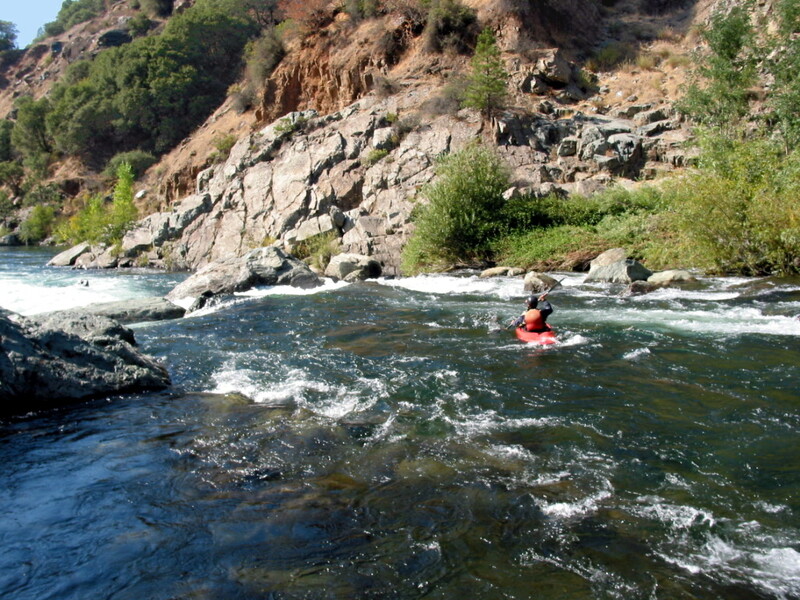 For the first few miles, water is swift with good gradient. At mile 2.5 you must choose to either run or portage class V Tunnel Chute. In the olden days, fiberglass kayaks turned sideways would be destroyed here, but nobody paddles kayaks that long nowadays. Commercial passengers sometimes fall out of boats, getting bruised and occasionally breaking bones here. However most people, if they swim, do so at the bottom where there is little risk of injury. After passing thru a man-made tunnel, boaters encounter good class III rapids for another few miles. At mile 5 comes Kanaka Falls, a class IV similar to Sunderland's Chute. 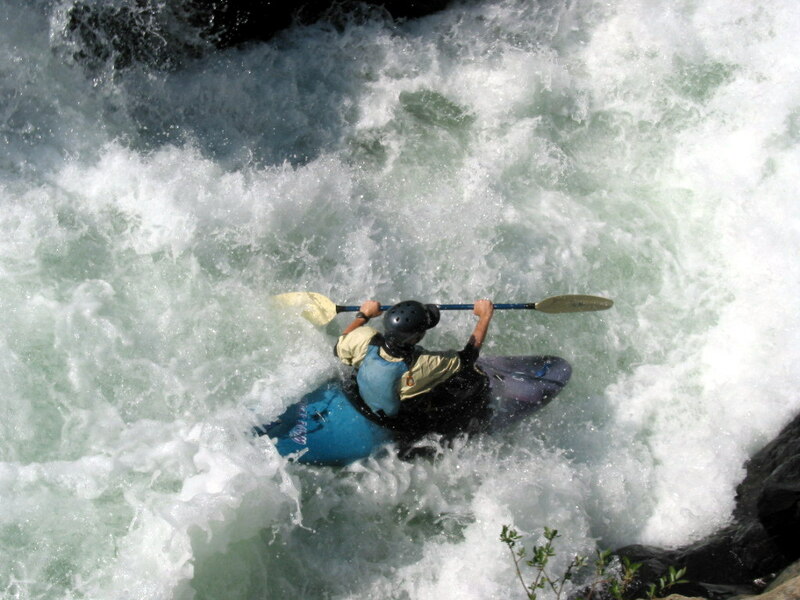 Avoid complacency: kayakers have dislocated shoulders here. A 4WD road climbs out of the canyon from Cash Rock at mile 6. 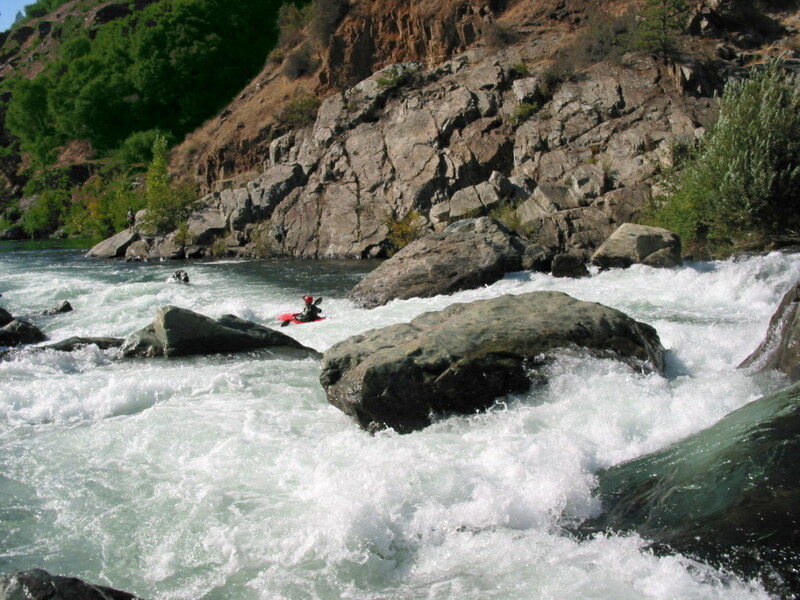 After that the gradient tapers off, and boaters encounter flatwater (class I-II) until near the end. However this the section has fine scenery and, along the banks, ripe blackberries in mid summer. It would be wonderful to camp overnight in this section. There are several campsites with composting toilets near mile 13. Around mile 14 the whitewater begins again, with class IV Upper Ruck-a-Chucky rapid, a portage, and a long series of class III-IV rapids to end the trip. 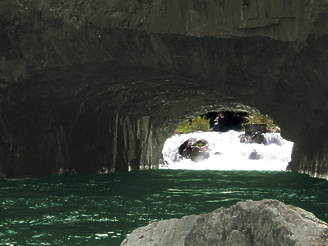 Put in near the penstock where Ralston Powerhouse releases a rush of water. If you don't see this, the flow is too low. North Fork of the Middle Fork enters on the right. Recognition: rocky pinnacle on the left, boulder bar backed by a dirt bank on the right. Access by dirt road. 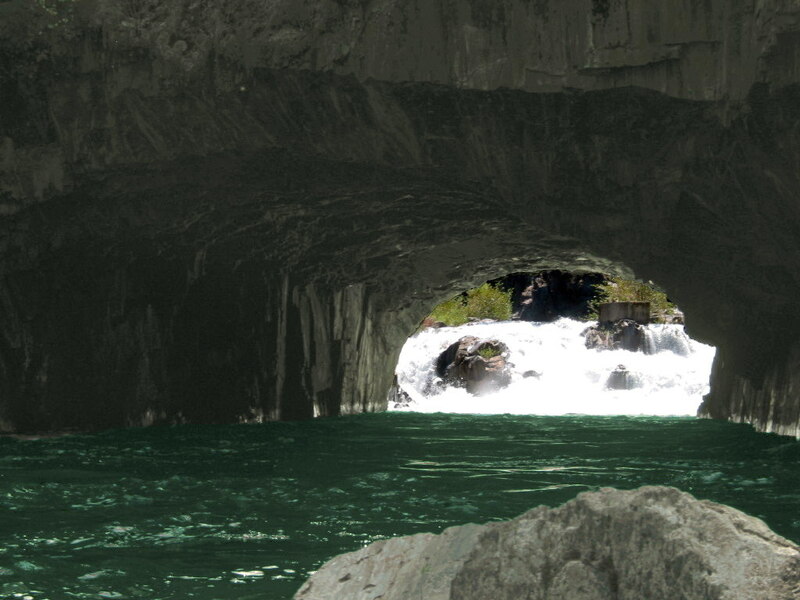 In the late 1800s, miners blasted this chute and tunnel to short-circuit a horseshoe bend so they could pick up gold. All the water drops about 15 feet over a distance of 80 feet. This rapid used to be feared by fiberglass-era kayakers, whose long boats could be shattered on the jagged rocks, but with shorter plastic boats, this is less of a risk. Most commercial rafting outfitters run this rapid now, by lining up carefully and having guests crouch down and hold on. Sometimes people fall out and get bruised or break bones, but usually people don't fall out until right near the end, where the swim is inconsequential. 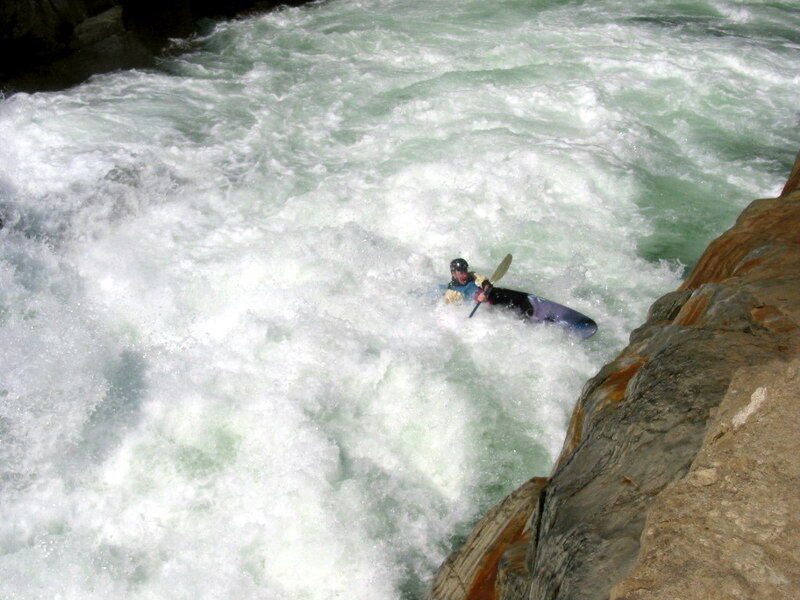 This kayaker wasn't so lucky The recovery pool is mostly underground! 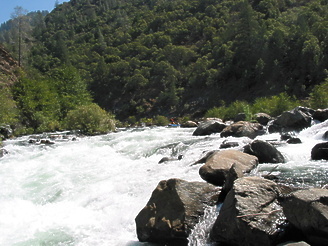 Class III rapids for the next two miles. 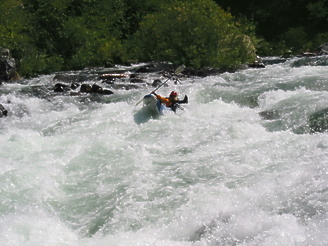 One rapid around mile 4 is called False Kanaka, for obvious reasons. 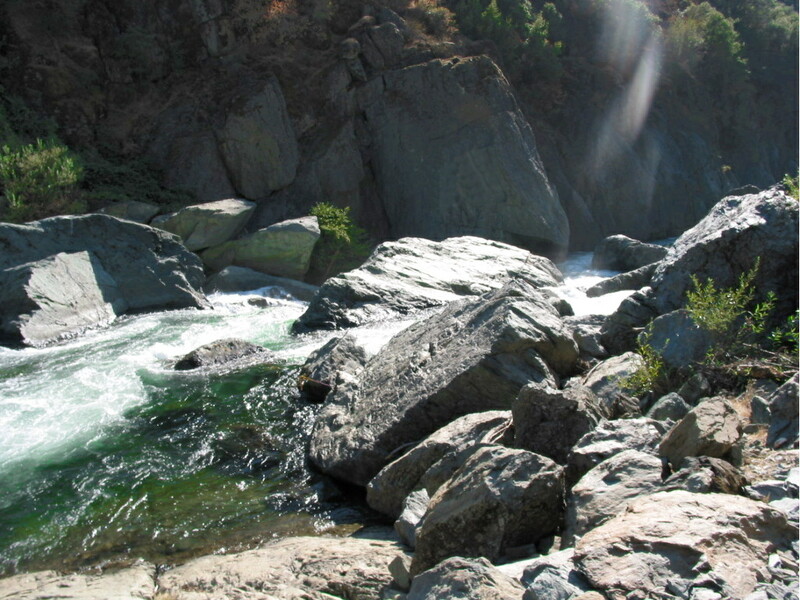 The river rushes to the right over a boulder bar and into a cliff that sheds large rocks. Only class I-II rapids for 9 miles. 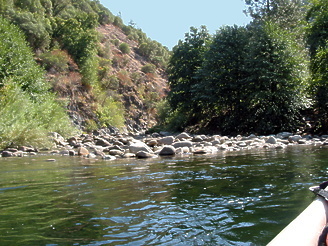 If you can slow down, you find many ripe blackberries along the river in July and August. Cash Rock, where a 4WD road climbs out of the canyon to Volcanoville. Sometimes boaters injured in Cartwheel are evacuated here by friendly gold-panners. A dirt road, requiring 4WD in some years depending on recent maintenance, leads down the right bank to McKeon Rd. 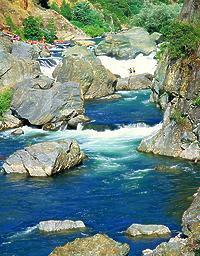 Good campsites in this area. A steep drop among large rocks, usually run right of center. Several visible and not-so-visible rocks lurk below the main drop. 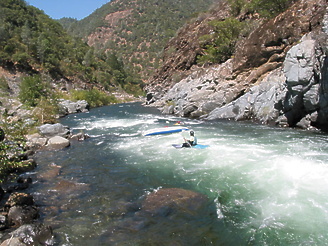 Only a short distance downstream is class V+ Ruck-a-Chucky. The pool between is not very long, so the first few boats are exposed unless you set rescue for them. 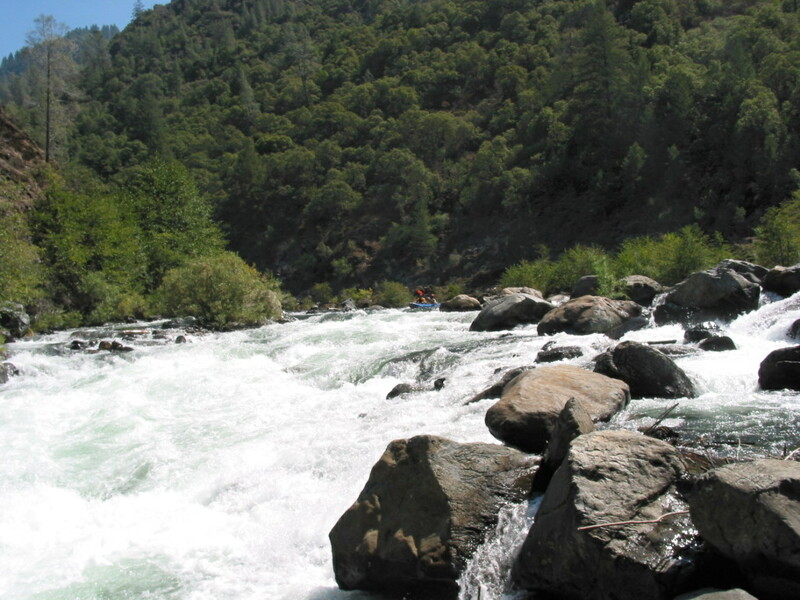 This rapid used to be unrunnable, but became merely V+ after high water re-arranged big boulders in winter of 1992. Before this rapid became less hazardous, several kayakers had tried to run it; all died or became partially paralyzed. There is an easy portage path and viewing platform on the right. Some kayakers say that the portage is easier, though exposed, on the left side, but that was before the portage path was built. 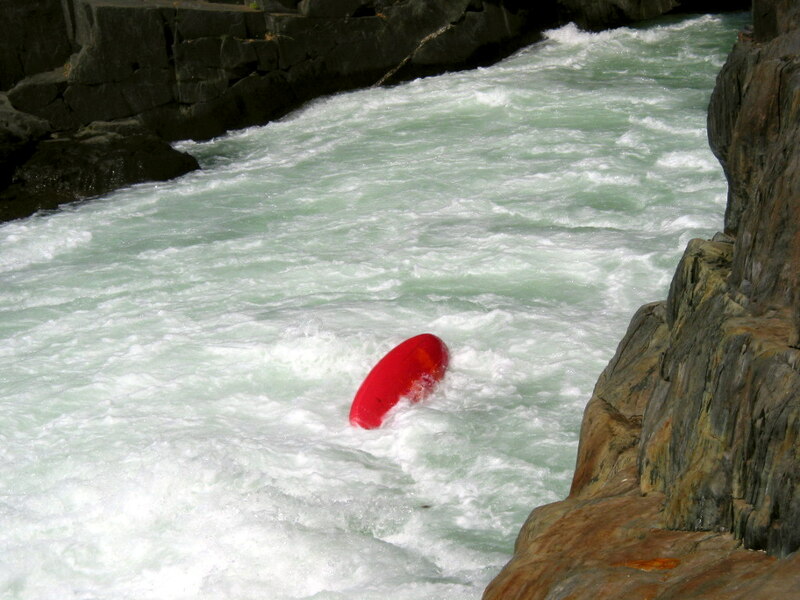 Some commercial outfitters ghost-boat their rafts over the falls. 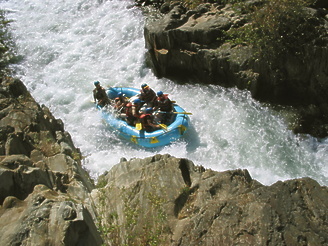 Others place a guide belly-down in each raft. Guests always walk around. After this, class III-IV rapids continue for over a mile. Take out at Greenwood Bridge site, where a useful bridge washed out in the 1964 flood after Hell Hole dam failed. A nice set of wide stone steps leads up to a parking lot. Almost all boaters shuttle on the right bank.